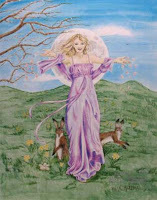 Ostara is the Norse Goddess of springtime and fertility and her festival is March 21, the Spring Equinox. So I have chosen Ostara as the Bad Witch's Goddess of the Week. "She is the Anglo-Saxon/Germanic Goddess of new beginnings, fertility, hope and renewal. It is a time of balance between day and night. Her symbols include the hare, coloured eggs, spring flowers, in older times celebrants wore brand new clothing to celebrate her festival." "Ostara is considered a maiden goddess, but instead of a new crescent, uses full moon energy. This makes sense if we consider that she is the goddess who fires up all the growth in the spring. Physics teaches us that an object at rest, tends to stay at rest, it takes more energy to begin momentum that continue it. Consider the seed sleeping beneath the earth or the bud tightly wrapped on a tree branch. Its like when the alarm goes off while you are snug under your blankets; the hardest part is just getting up and moving, and it takes a lot of energy to get started. That may explain a maiden with full moon energy." "Ostara was very popular with the Anglo-Saxon pagan brigade who worshipped her under the name Eostre — and kicked off the whole Easter business without a Jesus in sight. If you ever wondered what eggs and bunnies have to do with crucifixion and resurrection, the answer is: absolutely nothing." Eostre also has the name for the hormone Estrogen named after her.